Main Material: Made of high density cotton canvas and PU leather zips. It's a very durable shoulder bag. Dimensions: 10" L x 11" H x 5"W, small capacity but perfectly fits up to 10" Tablet, iPad, Kindle. Structure: A total of 9 pockets (7 zipped pockets, 2 external side pockets without zipper), 8 credit card slots, a pen slot, a neat little hole and a ring for a key chain. Awesome Design: The flap is held closed by a Velcro(cross-stitching, more durable), adjustable shoulder strap, a strong handle at the top so you can use it whenever you want. Warranty: All of our bags have 1-YEAR WARRANTY. Any problems with your bag, please contact us. We will solve it. Product Features: - Made of high density cotton canvas and PU leather zips,classic and fashion. It's a very durable shoulder bag. - Scientific andreasonable pocket lining design make your items lay in the bag systematically.There is a hole with a grommet to run your headphones through. - It has enoughpockets and capacity to organize your basic survival gear, as well as toconveniently carry the stuff you have to access regularly, like iPad, iPhone,external charger, iPod, cords, headphones, sunglasses, credit cards, cash,mints, snacks, water bottle and so on. - Freely adjustable shoulder strap, youcan adjust it according to your height and comfort requirements or use thehandle. The stitching on this product is nice and very strong. 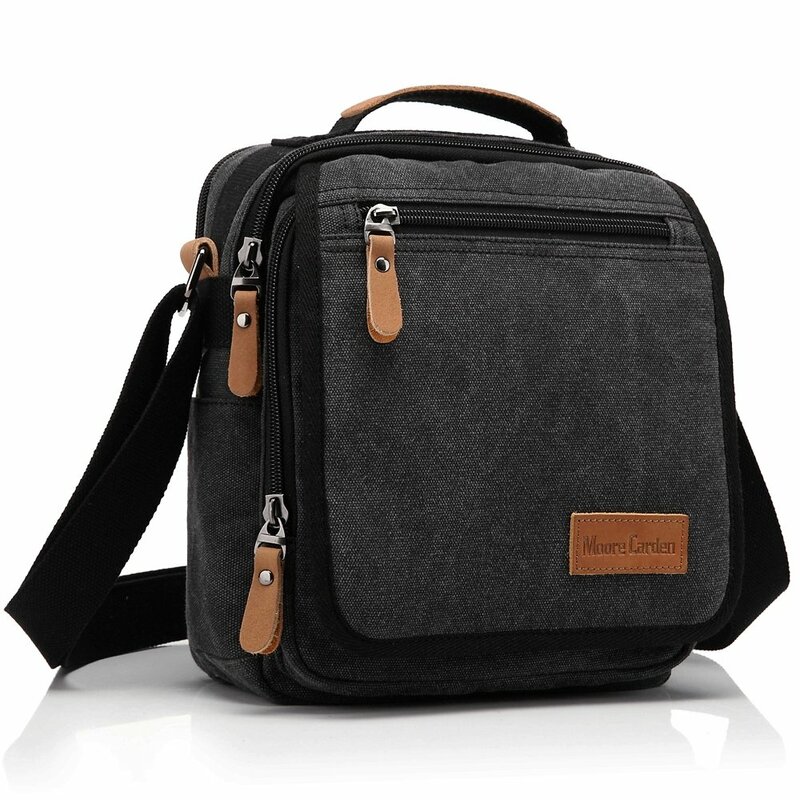 - Perfectmessenger bag/shoulder bag/crossbody bag/handbag/ hiking or traveling Bag,suitable for office, school, outdoor, business and other occasions. - It mustbe the ideal gift for Birthday, Thanksgiving, Christmas, anniversary. What youcan put in this Canvas Cross Body Shoulder Bag? - You can put A6 books, ipad,glasses, wallet, keys, cell phone, umbrella, document and cigaret in the bag.How to maintain the canvas bag? - Wash it with clean water in ordinarytemperature. - DO NOT wash it with hot water and alkaline detergent. - Hang todry and store in ventilated place instead of sun exposure. - Wash Separatelyto avoid staining. Package includes: - 1 Shoulder Bag About ibagbar: ibagbaris founded by a genuine group of the 80's and 90's generation. ibagbar is allabout easy-going lifestyle, freedom and good times. The bags are made classic,simply and old school. Most of them are made of cotton canvas and realleather, which adds to durability and awesomeness. ibagbar's mission is tomake you happy wearing its bags!